Pain in wrist symptoms can be so severe that you have to stop doing your work or participating in your favorite sports activities. Your Midtown Manhattan sports medicine team that specializes in pain management provides exceptional wrist pain treatment. Come to our NYC pain management clinic to get your wrist pain evaluation and treatment. Meet our pain doctor Febin Melepura M.D. to get the pain relief you need in the safe, reassuring hands of the best pain management doctor NYC. Wrist pain can occur due to everything from trauma to long-term wear and tear. Its causes may be ergonomic or due to repetitive stress. Other conditions such as carpal tunnel syndrome or tendonitis can cause pain in wrist symptoms. And you may need wrist pain treatment for sudden injuries or for arthritis. There are many factors that can cause pain in wrist symptoms. But you can’t know which of them is the culprit without the assistance and diagnostic capabilities of a talented sports medicine and pain management team of physicians in Manhattan. So, if you’re in pain, don’t wait for it to go away on its own; seek treatment from a qualified wrist NYC pain doctor. Not all pain in wrist symptoms require medical intervention. For example, if you sprain your wrist slightly during a game of touch football over the weekend and the swelling goes away in a day of rest and ice, you probably won’t need further care. On the other hand, if the swelling continues and is accompanied by redness and warmth to the touch, call your Midtown Manhattan sports medicine doctor for wrist pain treatment. You’ll come to recognize many wrist pain symptoms when you have chronic conditions such as osteoarthritis, which causes a dull ache in your wrists. 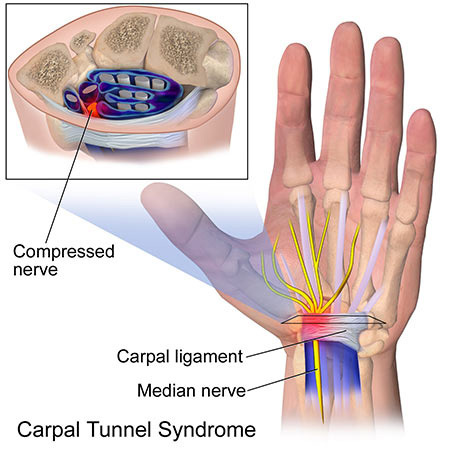 When your wrist feels like there are pins and needles sticking into it, you may be developing carpal tunnel syndrome, in which case you’ll want to see a doctor as soon as possible. Kienbock’s disease. A disorder that usually strikes young adults. The smaller bones in your wrist undergo progressive collapse, compromising blood flow to your wrist and hand, while causing extreme pain. Sports participation. Athletes who play sports that involve repetitive stress on the wrists — such as snowboarding, bowling, tennis, football, golf and gymnastics — are prone to fractures, sprains and other wrist problems. Ganglion cysts. Cysts that appear in the soft tissue of your wrist — that’s on the opposite end of your palm — can be painful when you’re not doing anything or get worse when you’re active. Jobs that demand forceful repetitive wrist motions, such as hair cutting and knitting, commonly lead to disabling wrist pain. Health conditions. Other conditions that are sometimes associated with wrist pain include diabetes, pregnancy, rheumatoid arthritis and obesity. Over-the-counter medicine such as ibuprofen can help to reduce swelling and pain, but stronger prescription pain medicine may be needed if you don’t find relief. Injections. Steroids or nerve block medications may provide relief when injected directly into your wrist. Physical therapy. A physical therapist can design specific exercises to strengthen your arms that will help prevent future pain in wrist symptoms. PT also is recommended after surgery. Sometimes, just immobilizing your wrist for a period of time may help it heal sufficiently. Your Midtown Manhattan sports medicine doctor provides you with recommendations when splints are most appropriate. You may need surgery to repair torn tendons or relieve pressure on your nerves when the tunnels through which the nerves run on the back of your hand don’t give them enough room. Broken bones also may require surgery to reset, often with screws or other hardware. Do you have any questions about the wrist pain treatment we offer in NYC? Would you like to schedule an appointment with the best rated wrist pain management doctor Febin Melepura MD of NYC pain management clinic? Please contact our office for consultation with the pain relief specialist in Midtown Manhattan.